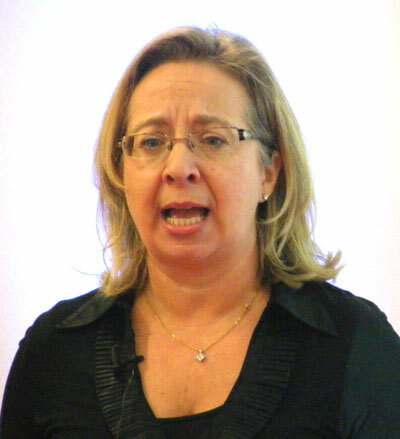 Laura Overton, from Towards Maturity, presented new research last month at Learning Technologies which showed that a surprising proportion of people working on training and development are unaware of whether senior management realize the benefits of introducing e-learning. The model on offer is to demonstrate value rather than complete a project that management understands and supports. One explanation for this could be that the technology introduced is changing faster than is generally known. Adobe concentrated on Flash and video with much less time for corporate documents such as flat PDF files. The recent survey shows that e-learning results in 11% cost saving, 28% time saving and that the volume of use has gone up by 48%. In the area of business agility, 82% believed they could deliver learning interventions faster and 59% reported improvements in ability to implement changes in products and procedures. However the survey also showed that 38% do not know if line managers agree productivity has increased (36% are unsure) and 28% don't know if new solutions are now focused on business performance (33% are unsure). This is a perception from people working on e-learning and not a direct form of research on management. There is still the implication that about a quarter of line mamgers both know that e-learning has contributed to productivity and communicate this to the people involved. Similarly it appears that about 40% of line managers communicate about business objectives. However this survey raises questions about models of business where there is supposed to be feedback to policy making or clarity of vision from leadership. Towards Maturity offer a model that starts with learner and work context and defining a need, then moves towards a demonstration of value. This could be a loop that gradually maintains a flow of resources for the projects. But it is not similar to assumptions about management systems in ISO standards where a policy statement has been agreed as strategy. As e-learning contibutes to the capability for changes in products and procedures there is a clear overlap with quality functions. Perhaps the clarity of feedback has been overestimated in much of the business theory. Areas such as training and quality are assumed to contribute to existing operations but rarely contribute to changes in policy. The recent acceptance of e-learning may have happened through a gradual process that has avoided opposition rather than gaining much support. Towards Maturity also launched a free booklet on what every professional should know about e-learning. It is available for download and there are extracts from the presentation on YouTube. Adobe presented mostly about Flash and online conferencing. They appear to have moved away from Postscript related products such as books or paper. Many senior managers would have found the selection of media surprising. PDF files started to be accepted because the design followed the look of a printed page. At Information Technologies there was emphasis on the feature that Connect can be launched from the Acrobat menu. Connect is entirely in Flash. It is rare to see a PDF file in Connect, even if transformed into Flash paper. There is no way to save the comments or other content as PDF. The feature most promoted was that PDF can now contain Flash for video or sound. So Flash is a native format within Acrobat. It was mentioned that this could be a way to distribute Flash content even if the Flash player is not allowed within some organisations. The implication is that Flash design is sometimes reaching corporate desktops indirectly, not as the result of any plan. Edvantage showed a PDF book with video, created in CourseBuilder for a schools in Sweden and Norway. This is still quite rare even though Adobe have promoted the option for a while. The link to schools confirmed my view that a show about adult learning should be held at the same time as BETT, a technology show for schools. They are both in January and BETT now reaches part of Olympia 2. There are different organisers at the moment. Printweek recently reported that Adobe has closed the Print Service Provider partner programme in the UK due to declining membership. John Cunningham from Adobe UK said "Maybe it looks like Adobe isn't interested in the traditional print side anymore - of course we are, it's still a huge part of our business." However there is no sign yet of an Adobe stand on the floorplan for IPEX, a print show in Birmingham this May. 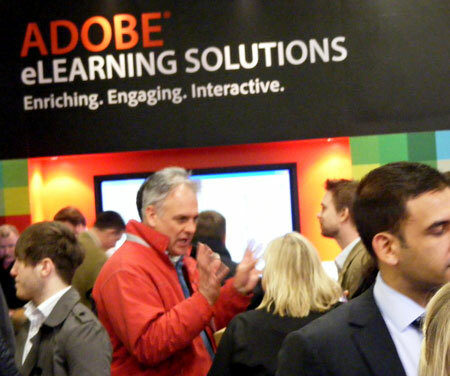 My guess is that the Flash presence at Learning Technologies is a reasonable guide to Adobe marketing energy. This year there was also a show for Learning and Skills on the floor below. It was not very clear what the difference was. Some stands such as the Virtual College apparently booked too late for the upper floor. Media Training were part of the Technology show last year but they offer day courses so fitted better with Skills. The skills include XML and Flex though they still offer courses on Quark and InDesign. Print design and publishing are still an interest. It struck me that had a sudden flow of mud arrived at Olympia, a future archaeologist might have assumed that there were two levels of mud for different time zones of technology. Media Training represent a balance of media as currently supported; Adobe on the next level may be seen as normal some time in the future. The Learning and Skills floor also included some training companies that had nothing to do with technology but offered personal development for managers and support for policy development. There was no obvious presence from business schools or universities except for conference facilities. The University for Industry had a large stand as LearnDirect, the trading name they are allowed to use. The word "university" is strongly protected in the UK. From some Twitter remarks I gather there were several people from the Open University at the conference but there was no stand at the show. The guide to Learning Technologies had an introduction from Lord Puttnam that made a strong case for e-learning and was a solid launch for the event. However there was one theme that I would like to question. He claimed that while educational organisations have a concern to sustain the "moral" position of learning within society, there are also the commercial ambitions of the Murdochs, the Microsofts or the Googles. As Chancellor of the Open University he has a proper concern with this but I think things could be more complicated. Commercial organisations make different claims for their knowledge offers. James Murdoch somehow connects media for democracy and a free market. Google claims a role in organisaing information and scanning content for public benefit. Both claims are contested but there is some sort of moral position. Also there could be a downside for educational organisations to behave as if morality always demands a distance from commerce. I am interested in "mode two" knowledge, combining academic disciplines in practical situations. Most e-learning research could be seen as like this. I have heard tell of views on the "dark side" of mode two though I cannot find any detail or references. Two events may shed some light on this. A Higher Education Leadership Summit has a technology showcase during lunch. Not the scale of Learning Technologies but the issues may be similar. If universities have a different moral basis to most organisations, how will this show up in the conclusions? So far there is some news emerging on Cloudworks. Martin Bean, Vice-Chancellor of the Open University (OU) has spoken about university trends for globalisation, massification, and privatisation on the model in the USA. He previously worked for Microsoft. The OU reaches 1,47 million people a year through iTunes U, part of Apple. In Lancaster there will be a workshop on innovation as part of a conversation about experimentality. The description of a future conference includes the claim that the idea of the experiment has helped to "shape the contemporary world of evidence-based policy, clinical trials and audits". Driven by pervasive informationalisation, we can observe a number of interlinked trends, including: the acceleration and proliferation of feedback loops between action and reaction; the displacement of fixed structures by networks and dissipative structures; the abandonment of fixed goals for continuous repositioning; and the carrying out of knowledge-work in the context of application. My concern is that the moral case for universities may be seen as depending on distance from application. There are claims for the value of funding for research. In the case of e-learning contributions come from various sources. Sometimes I think we made a terrible mistake as an industry by calling these systems learning management systems because they're not really about learning, at least not in the senses you mean above. It's not about learning qua learning. It's about making sure the right people get the information they need to do their jobs, when they need it and in forms that are easy for employees to use in their usual work processes. These systems are about helping companies and governments assure staff and user competence in ways that can be verified and validated. Quality assurance aspects could gather more support for e-learning. iTunes U is a positive development but it did not really start in universities. The impression I get from an Apple store is that there is more interest in sound and video than in flst pages. Adobe may have some support for the direction they are promoting, even if Flash is not quite good enough for the iPhone. The way in which organisations adjust to changes in digital literacy could turn out to be complicated.